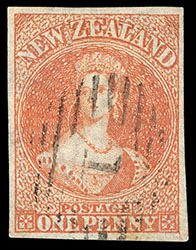 New Zealand, 1862, Queen Victoria "Chalon Head", 1d bright orange vermilion, imperf, Large Star watermark, unused without gum, full to large even margins, deep radiant color, Extremely Fine and choice. Scott No. 11. Campbell Paterson No. A1e (1). SG No. 33 £1,000 ($1,310). 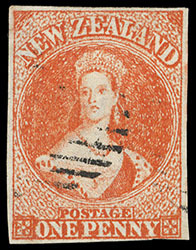 New Zealand, 1862, Queen Victoria "Chalon Head", 1d orange vermilion, imperf., Re-entry (R. 17/10), Large Star watermark, unused without gum, clear to large margins clear showing variety at bottom, small thin spot at top, Very Fine appearance, scarce plate variety. Scott No. 11 var. Campbell Paterson No. A1e (Z). SG No. 33 var. £1,000+ ($1,310). 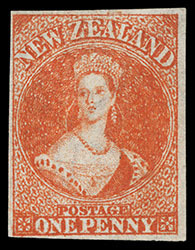 New Zealand, 1862, Queen Victoria "Chalon Head", 1d orange vermilion, imperf, Re-entry (R. 5/8), Large Star watermark, large even margins all around, bright color and paper, neat numeral "1" barred oval of Auckland, fresh and Extremely Fine. Scott No. 11 var. Campbell Paterson No. A1e (Z). SG No. 33 var. £275 ($360). New Zealand, 1862, Queen Victoria "Chalon Head", 1d bright orange vermilion, Large Star watermark, large margins except clear at bottom, beautiful vibrant color on bright paper, light partial barred oval cancel, fresh and Very Fine, Marcel Stanley. Scott No. 11 var. Campbell Paterson No. A1e (1). SG No. 33 var. £275 as normal ($360). 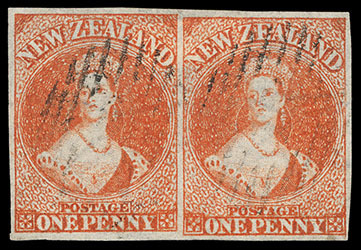 New Zealand, 1862, Queen Victoria "Chalon Head", 1d orange vermilion, imperf, Large Star watermark, horizontal pair, large margins, deep vibrant color on bright paper, each cancelled by indistinct barred oval, an Extremely Fine pair with beautiful color. Scott No. 11. Campbell Paterson No. A1e (2). SG No. 33 £550 as singles ($720). Joseph Hackmey, Spink Shreves, May 2010, lot 2195. Scott No. 11. Campbell Paterson No. A1e (2). SG No. 33 Estimate $1,000 - 1,500. ONE OF ONLY TWO SURVIVING NEW ZEALAND USAGES FROM THE P.&O. "COLUMBO" WRECK BEARING STAMPS. The P&O "Colombo" wrecked on Minicoy Island in the Indian Ocean on November 19th 1862 in a heavy fog. All of the passengers and crew were safely put into boats and were taken care of on Minicoy Island until they were rescued by the "Ottawa" on Nov. 30th. 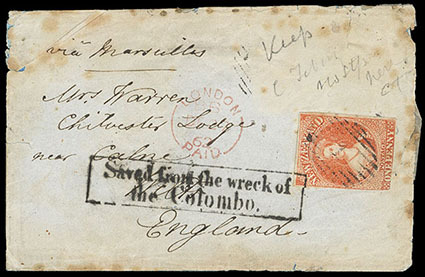 The greater portion of the mail was recovered by divers, and, after careful drying, the letters were forwarded to their destinations. Those for London arriving either December 27th or 31st, 1862. 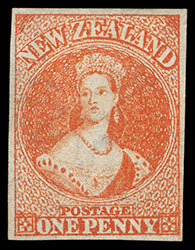 New Zealand, 1862, Queen Victoria "Chalon Head", 1d orange vermilion, imperf, Large Star watermark, large margins all around, used with 2d deep blue (70) and 6d black brown (75), both s.e. 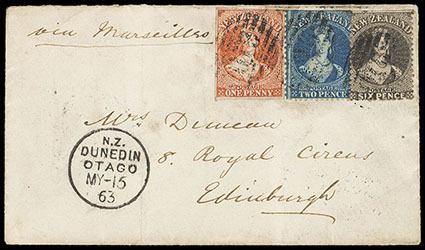 at top, each cancelled by strike of "O16" cancel, matching "Gold Field, Otago N.Z., MY 13, 63" origin backstamp on Duncan correspondence cover to Edinburgh, Scotland, endorsed "via Marseilles" at top left, bold "Dunedin, Otago, MY-15, 63" transit cds, Edinburgh (7.16) arrival backstamp; light vertical folds, Very Fine and choice, ex-McNaught. Scott No. 11. Campbell Paterson No. A1e (2). SG No. 33 Estimate $2,000 - 3,000. AN EXCEPTIONAL THREE-COLOR MIXED ISSUE FRANKING FROM GOLD FIELD AT THE 9D RATE VIA MARSEILLES TO THE UNITED KINGDOM. 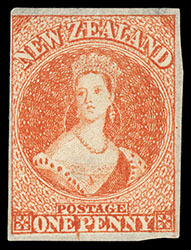 New Zealand, 1862, Queen Victoria "Chalon Head", 1d vermilion, imperf, Re-entry (R. 18/6), Large Star watermark, unused without gum, clear to large margins, deep radiant color and strong impression, Very Fine, Joseph Hackmey. Scott No. 11e var. Campbell Paterson No. A1e (Z). SG No. 34 var. £750 ($980). 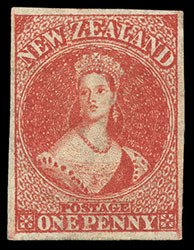 New Zealand, 1862, Queen Victoria "Chalon Head", 1d carmine vermilion, imperf, Large Star watermark, part o.g., large even margins, beautiful rich color, choice and Extremely Fine. Scott No. 11d. Campbell Paterson No. A1e (4). SG No. 35 £450 ($590). 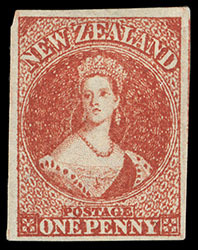 New Zealand, 1862, Queen Victoria "Chalon Head", 1d carmine, imperf, Large Star watermark, rare shade, unused without gum, large margins all around, intense color on bright paper, an Extremely Fine gem unused example of this rare shade, Yeroc, J.M.A. Gregson, January 2000, lot 191. Scott No. 11f. Campbell Paterson No. A1e (5). SG No. 35 var. £450+ ($590).